Departamento de Física, Universidade Federal do Maranhão, São Luís - MA, 65080-805, Brazil. Encapsulation of nanowires by carbon nanotubes is a very efficient manner of protect the nanowire from external influences, as oxidation. Moreover, it permits to produce strictly linear chains of atoms if the carbon nanotube is very narrow. Although many theoretical studies have been performed concerning this subject, a few take in account the effects of the Peierls distortion, which dimerizes the chain. To contribute to this topic, here we report first principles calculations based on density functional theory of Fe, Co and Ni nanowires encapsulated by narrow zigzag or armchair carbon nanotubes. Ours findings predict that Fe nanowire has a minimum energy configuration for a dimerized geometry and a deep local minimum for a non-dimerized one. Also we find that Co and Ni have a regular-spaced configuration as the lowest-energy geometry, but Co nanowire exhibits a local minimum for a dimerized configuration, whose energy barrier is independent on the nanotube diameter and chirality. Moreover we find that all nanowires transfer electrons to the nanotube and the magnetic moments of the dimerized nanowires are at least 50% smaller than the corresponding for the non-dimerized ones. In some cases there exists a vanishing of the magnetic moment even when the non-dimerized nanowire has a non-zero value. Such findings can help to predict structural, electronic and magnetic properties of nanowires encapsulated by carbon nanotubes and give an insight concerning if the differences of those two geometries for the nanowires can produce experimentally detectable data. One-dimensional structures formed by a linear chain of regular-spaced atoms are unstable. To lower the energy, the atoms move closer to one neighbor and further away from the other one, generating short and long alternated bonds which dimerize the 1D lattice where the short bond lowers the energy more than the long bond increases it. In this way, the lattice parameter doubles its value and the chain undergoes a transition known as Peierls distortion . The regular-spaced lattice is supposed to be metallic, but according to second-order perturbation theory, this lattice dimerization creates an energy gap in the contour of the Brillouin zone and the system becomes semiconductor. The first experimental observation of the Peierls distortion was in the 1970s when an organic material known as TTF-TCNQ, theorized to be a superconductor at high Tc , was synthesized and it was observed that such material was an insulator rather than a superconductor . Nanowires with nanometer or sub-nanometer resolution can be synthesized by using several techniques, as for example electrochemical deposition, nonhydrolytic solution, hydrogenation in a flow of gas mixture, manipulation by a STM tip or in simple mixture of chemicals [4-9]. However, to synthesize linear atomic chains, such methods are not efficient due to oxidations, bonds disruptions or out-of-line distortions in the synthesis process. A more recent technique employs carbon nanotubes to help in synthesize linear nanowires, where the carbon nanotube (CNT) encapsulates the nanowire, providing a safe environment against those external factors. With this procedure, it was successfully synthesized nanowires made of a variety of elements [10-15]. In the theoretical point of view, the encapsulation of nanowires by CNTs was extensively studied in the past few years, where density functi onal calculations have shown that depending on the nanowire, the encapsulation reduces the total magnetic moment of the nanowire, and under determined conditions, as applying radial pressure on the CNT, the magnetic moment can even vanishes [16-19]. Although those calculations aim to reproduce experimental data or predict new properties, none of them take in account the Peierls distortion of the encapsulated nanowire. Here we show that the lattice dimerization plays an important role in determining electronic and magnetic properties of encapsulated nanowires. 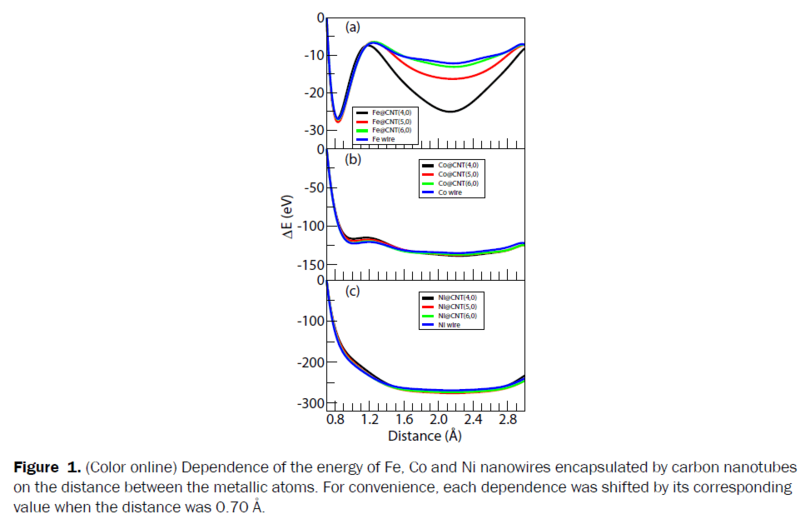 To perform this investigation, we employed first principles calculations to determine energetic, electronic and magnetic properties of Fe, Co and Ni nanowires encapsulated by zigzag or armchair carbon nanotubes. Details and technical information concerning the calculations are described in the next paragraphs. Main results are reported after, followed by our conclusions. All spin-polarized calculations performed in this investigation were done by using the SIESTA code, which applies the density functional theory in a standard way. Troullier-Martins norm-conserving pseudopotentials in the Kleinman-Bylander form were used [20-24]. For the exchange-correlation potential, we applied the generalized gradient approximation as parametrized by Perdew- Burke-Ernzerhof . The basis set used was a double-ζ plus polarization with a real-space mesh determined by a plane-wave of 300 Ry. The 1D Brillouin zone was described by 51 k-points according with the Monkhorst-Pack scheme . Finally, the system was considered optimized when the maximum atomic force was less than 0.02 eV/Å. In order to avoid undesired interactions, in the non-periodic directions the nearest atoms remain in a distance greater than 10 Å. The unit cell of the system was constructed in such way that two atoms of the nanowire could be independent and the number of carbon rings of the CNT was determined in order to provide a better comensurability between original lattice parameters of nanowire and carbon nanotube. This procedure resulted in two (one) primitive cells to the armchair (zigzag) CNT. The carbon nanotubes selected to encapsulate the nanowires were (n,0) zigzag and (n,n) armchair with n = 4,5,6. Such CNTs were chosen due to their reduced diameters, which maintain the nanowire a straight line. We performed an initial calculation to relax each CNT and the nanowire inside. After this, we applied geometric constraints by fixing the positions of all atoms and varying the distance between the metallic atoms from 0.70 Å to 3.00 Å with an increment of 0.02 Å. For each distance, we perform a single calculation with the same simulation criteria explained before. With this procedure, we determined some properties in function of the distance between the two atoms of the nanowire. With the procedure explained previously, we obtained the energy in function of the distance between the metallic atoms, as shown in Figure 1 for zigzag CNTs encapsulating nanowires. The results for nanowires inside armchair CNTs are similar and are not shown here. As one can see in Figure 1a, for Fe@CNTs there exist two energy minima with the dimerized nanowire being the lower-energy configuration while Co@CNTs also exhibit two energy minima but now the non-dimerized nanowire is the most stable configuration (Figure 1b). For Ni@CNTs, there exists only the energy minimum for the non-dimerized nanowire, as shown in Figure 1c. This finding is in accordance with previous density functional calculations which assert that for a strictly linear Ni nanowire, there is no distortion . The energy barrier from the dimerized configuration to the non-dimerized one is practically independent on the CNT diameter, as can be seen in Figure 1a and 1b, being estimated in ∼ 21 eV (∼ 18 eV) for encapsulation of Fe by zigzag (armchair) CNTs and ∼ 2eV for Co inside both zigzag or armchair CNTs. Concerning the Fe encapsulation, our findings predict that a regular-spaced Fe nanowire inside a carbon nanotube is stable with a very deep minimum energy, but the dimerized state still is the true minimum energy. For Co encapsulated by CNTs, Figure 1b shows that the confined space inside the CNT allowed a formation of the Peierls distortion in the Co nanowire, once for isolated linear Co chain there is only one energy minimum configuration which is the regular-spaced geometry . Thus, here we predict that it is possible to synthesize a dimerized Co nanowire inside a narrow CNT energetically protected by a barrier of ∼ 2 eV independent on the CNT and for a reasonable range of CNT diameters. In addition, Figure 1 also shows that the CNT diameter has no influence on the position of any energy minima. This means that encapsulation cannot increase or decrease the length of the bonds in a Peierls distortion. For each energy minima we performed an optimization calculation without geometric constraints. All optimized structures are very similar, and can collectively be represented by Fe@ CNT(6,0) and Fe@CNT(4,4) shown in Figure 2. Figure 2: (Color online) Optimized structures for Fe@CNT(6,0) (left) and Fe@CNT(4,4) (right) for dimerized (top) and nondimerized (bottom) nanowires. Each figure shows three unit cells. This latter optimization provides a more reliable comparison between the two energy minima. Table 1 shows the difference ΔE = Edimerized – Enon-dimerized between the energies of the two possible configurations. In this Table, negative (positive) values indicate that the dimerized (non-dimerized) configuration is more stable. As one can see, for the encapsulation of Fe by zigzag CNTs, as the diameter increases, the non-dimerized configuration becomes less stable (Figure 1a), which does not occur when the Fe nanowire is inside an armchair CNT, once the difference remains practically unchanged as the diameter varies. For the Co nanowire encapsulated by a zigzag CNT, the behavior is the opposite of that one for the Fe case, since the energy difference decreases as the diameter increases. Once again for armchair CNTs ΔE is almost the same for all diameters. Our findings are in agreement with Ataca et al. , since according to their calculations, for linear chains, Fe exhibits a dimerized geometry while Co and Ni exhibit a non-dimerized one and our results show that for a large diameter, the nanowire tends to behave as if it was isolated. Table 1. Energy difference (E) between the dimerized and non-dimerized configuration, charge transfer (Δ Δq ) from the nanowire to the carbon nanotube and magnetic moments (μ). The index d (nd) in Δq and μ indicates the dimerized (non-dimerized) configuration. The units of energy, charge transfer and magnetic moment are eV, | e | and μB, respectively. To identify if the encapsulated nanowire is dimerized or not, experimental techniques such as high-resolution transmission electron microscopy can be used. Depending on the resolution of the microscope, the short-bond length for the dimerized nanowire could not be clearly identified. Another option is to verify the nanowire configuration by its influence on the electronic and magnetic properties of the carbon nanotube. Table 1 shows the charge transfer from the nanowire to the nanotube in amounts of | e | as well as the total magnetic moment in units of μB. As one can see in this Table, for systems with two energy minima, most dimerized nanowires transfer a greater amount of charge to the CNT in comparison with the non-dimerized one, with exception of Co@ CNT(6,0) and Co@CNT(4,4). Encapsulated Ni nanowire has similar values of the charge transfer in comparison with encapsulated non-dimerized Fe and Co nanowires. The difference between the results obtained for the two geometries is even more remarkable when we analyze the magnetic moment, also exhibited in Table 1. As once can see, all dimerized nanowires have a magnetic moment smaller than the non-dimerized one. In several cases μ vanishes when the nanowire undergoes the Peierls distortion while the non-dimerized configuration exhibits a non-zero magnetic moment. The lowest reduction of μ from the non-dimerized geometry to the dimerized one was 55%. As many theoretical studies have been reported only regular-spaced chains, their predictions concerning charge transfer and specially magnetic moment may not be experimentally detected once the nanowire could remain in the dimerized energy minimum and as we shown here, there are differences in such properties, mainly with regard to magnetic ones. First principles calculations based on density functional theory have been performed in dimerized and non-dimerized Fe, Co and Ni nanowires encapsulated by narrow zigzag or armchair carbon nanotubes. Our findings show that the true energy minimum for encapsulated Fe nanowire is with a dimerized geometry and the non-dimerized configuration remains in a (deep) local energy minimum. The Co nanowire has the opposite behavior, in comparison with Fe encapsulation, where the non-dimerized configuration is more stable than the dimerized one. Encapsulated Ni nanowires exhibit a non-dimerized geometry. The energy barrier from the dimerized geometry to the non-dimerized one was found to be independent on the nanotube diameter for Fe encapsulation and independent on both, diameter and chirality for the encapsulated Co nanowire. All nanowires transfer electrons to the nanotube, where in general the dimerized nanowire transfers more than the non-dimerized one, but the differences are not so great. Finally, the magnetic moment exhibits very reduced values for the dimerized structure in comparison with the non-dimerized one. All reductions are greater than 50% and in some cases the magnetic moment vanishes even when the non-dimerized version of the nanowire has a non-zero magnetic moment. Such findings could be useful in the determination of geometric conformation of onedimensional nanowires encapsulated by carbon nanotubes as well as prediction of electronic and magnetic properties of those systems. We would like to thank Fundação de Amparo à Pesquisa e ao Desenvolvimento Científico e Tecnológico do Maranhão (FAPEMA), Coordenação de Aperfeiçoamento de Pessoal de Nível Superior (CAPES) and Conselho Nacional de Desenvolvimento Científico e Tecnológico (CNPq) for the financial support. Kittel C. Introduction to Solid State Physics. Wiley. 2004; 8th edition. Little W. Physical Review. 1964; 134(6A): 14-16. Anderson PW et al. Solid State Communications. 1973; 13(5): 595. Sellmyer DJ et al. Journal of Physics: Condensed Matter. 2001; 13(25): 433. Ji R et al. Journal of Magnetism and Magnetic Materials. 2014; 363: 95. Liu C and Yang S. ACS Nano. 2009; 3(4): 1025. Kovic A et al. Nanoscale Research Letters. 2012; 7(1): 567. Nilius N et al. Science. 2002; 297(5588):18-53. Huo Z et al. Nano Letters.2008; 8(7):20-41. Lijima S. Nature. 1991; 354(6348): 56. Muramatsu H et al. Nano Letters.2008; 8(1): 237. Meunier V et al. Nano Letters. 2009; 9(4): 1487. Kitaura R et al. Angewandte Chemie International Edition. 2009; 48(44): 82-98. Shi L et al. Nano Research.2011; 4(8): 759. Fujimori T et al. ACS Nano. 2013; 7(6): 5607. Kang YJ et al. Physical Review B.2005; 71(11):115-441. Ivanovskaya VV et al. Physical Review B. 2007; 75(7): 75410. Jo C. Journal of Physics D: Applied Physics. 2009; 42(10): 105008. Diniz EM et al. Physical Review B. 2010; 81(15): 153-413. Soler JM et al. Journal of Physics: Condensed Matter. 2002; 14(11): 27-45. Hohenberg P and Kohn W. Physical Review. 1964; 136(3B): B864. Kohn W and Sham LJ. Physical Review. 1965; 140(4A): A11-33. Troullier N and Martins JL. Physical Review B. 1991; 43(3): 19-93. Kleinman L and Bylander DM. Physical Review Letters. 1982; 48(20): 14-25. Perdew JP et al. Physical Review Letters. 1996; 77(18): 38-65. Monkhorst HJ and Pack JD. Physical Review B. 1976; 13(12): 51-88. Ataca C et al. Physical Review B. 2008; 77(21): 214-413.